Charged with reviving the money-losing maker of flexible circuit boards in August, 2003, Mr. Fielding knew he had to work quickly to shore up employee morale and secure the confidence of his impatient venture-capital investors. He'd been promised new financing before the end of the year, but that pledge was contingent on his ability to prove the company was worth fixing in the first place and, not least, on coming up with a sound strategy to save it. "One hundred days is probably, in my case, a pretty good measure of the time I had," said the computer industry veteran, who previously was chief operating officer of Toronto-based integrated-circuit maker Gennum Corp.
As executives face more scrutiny from shareholders, directors, customers and even the media, management experts say the first 100 days of a CEO's tenure, roughly speaking, can mean the difference between success and failure. First impressions with most employees and directors are established in that time. And with today's emphasis on quarterly financial results, shareholders, too, want tangible results after as little as three months. Experts say the basic criteria for success are tested in the first few months of a CEO's tenure -- everything from "soft" attributes, such as compatibility with the corporate culture, to communication skills, to establishing key relationships with critical stakeholders, such as board members and other managers. Barbara Morris, president of Morris Group International Inc., an executive search and leadership development firm based in Toronto, says pressure on executives to deliver early is behind the ever-shrinking tenure of corner-suite executives. According to recent studies, she says, between 40 and 45 per cent of senior executives leave their jobs within 18 months, either from frustration or because they've been pushed out by an impatient board. 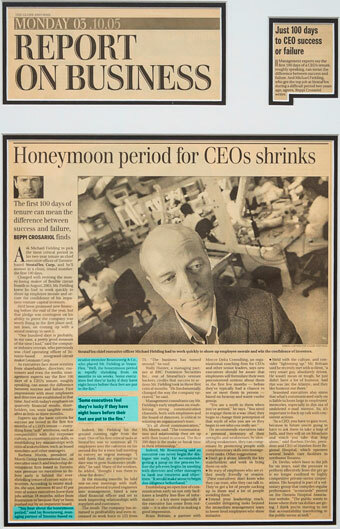 "You hear about the honeymoon period," said Jay Rosenzweig, managing partner of Toronto-based executive recruiter Rosenzweig & Co., who placed Mr. Fielding at StrataFlex. "Well, the honeymoon period is rapidly shrinking from six months to six weeks. Some executives feel they're lucky if they have eight hours before their feet are put to the fire." Indeed, Mr. Fielding hit the ground running right from the start. One of his first critical tasks at StrataFlex was to summon all 75 employees into the cafeteria on his second day for a town hall meeting to convey an urgent message. "I told them that my experience to date was to grow businesses profitably," he said. Many of the workers, he added, "thought I was there to close the doors." In the ensuing months, he held one-on-one meetings with staff, promoted several trusted engineers into management, hired a new chief financial officer and set to work improving relationships with suppliers and customers. The result: The company has returned to profitability and even increased its work force to 125 from 75. "The business has turned around," he said. Wally Hunter, a managing partner at RBC Dominion Securities Inc., one of StrataFlex's venture backers, credits that success to actions Mr. Fielding took in those first critical months. "He fundamentally changed the way the company operated," he said. Management consultants say Mr. Fielding's early emphasis on establishing strong communication channels, both with employees and the board of directors, is critical to winning an organization's trust. "It's all about communication," Ms. Morris said. "The communication and relationship they set up with their board is crucial. The first 100 days is the make-or-break time in their relationship." Indeed, Mr. Rosenzweig said an executive can never begin the dialogue too early. He recommends getting a jump on the process before the job even begins by meeting with directors and other managers to hash out concerns and objectives. "It would make sense to begin due diligence beforehand." Establishing an open line of communication early on not only facilitates a healthy free-flow of information -- a key move especially if the executive has come from outside -- it is also critical to making a good impression. Brian Brittain, a partner with Mercer Delta Consulting, an organizational coaching firm for CEOs and other senior leaders, says new executives should be aware that employees will formulate their own preconceived notions about them in the first few months -- before they've typically had a chance to see or meet them in person -- based on hearsay and water-cooler gossip. "You are a myth to them when you've arrived," he says. "You need to engage them in a way [that] they begin to change their perception of that myth of who you are so they begin to see who you really are." Don't go it alone. Identify the key stakeholders and work to bring them on side. Be wary of employees who are either overly friendly or evasive. "[New executives] don't know who they can trust, who they can talk to. They've got a lot of people sucking up to them and a lot of people avoiding them." Extend your leadership reach. Consider delegating tasks beyond the immediate management team to lower-level employees who show initiative. Meld with the culture, and consider "lightening up." Mr. Brittain said he recently met with a client, "a very smart guy, absolutely driven. He wasn't mean or tough, he just didn't have a lot of humour. And this was [in] the Atlantic, and they like humour out there." Seasoned executives also stress that what's communicated early on is liable to loom large in employees' memories, especially in this era of undeleted e-mail memos. So, it's important to back up talk with consistent actions. "As a CEO, you have to gain trust, because in future you're going to have to ask them to take a leap of faith, and they will sit on bleachers and watch you take that leap alone," said Rueben Devlin, president and CEO of Humber River Regional Hospital, which operates several health care facilities in northwest Toronto. Dr. Devlin, who's been in the job for six years, said the pressure to perform effectively from the get-go is no longer confined to highly competitive private-sector corporations. His hospital is part of a voluntary group that compiles regular performance "scorecards" posted on the Ontario Hospital Association website. "The public wants to know where their tax dollars are going. I think you're starting to see that accountability transferring to the public sector as well."